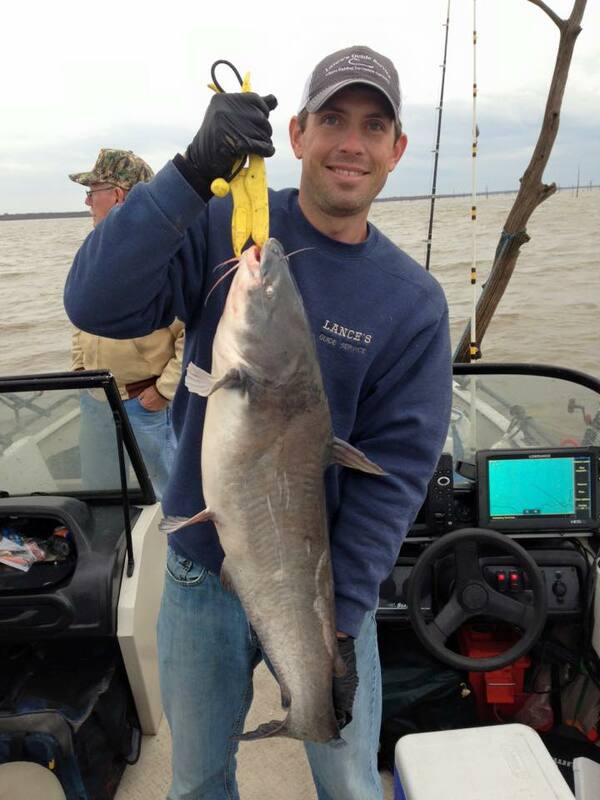 We met our good friends at Kaw Lake to eat, have fun, and of course the guys went chasing blue catfish! We didn’t have great conditions, but we made the best of it anyway. The lake is up, so they started releasing a good amount of water the morning we got there…oh and the wind hit the 35mph mark making it a tad sporty on the water. 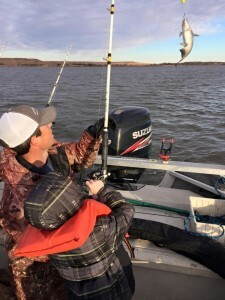 We did manage to find an area out of the big swells holding blue catfish and put the little man on them. 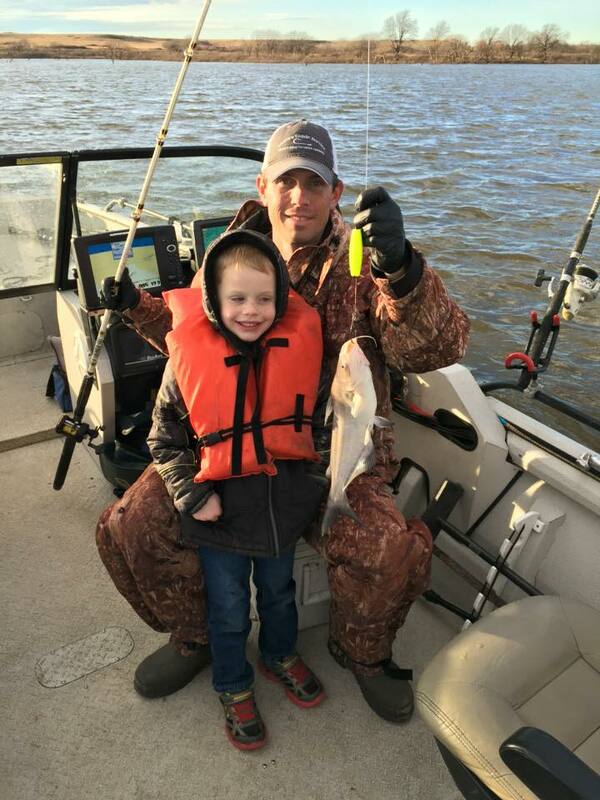 We had a great time catching dinner. The fish were caught were in a little creek channel gorging on small gizzard shad. Once we found feeding fish the action was fast with multiple rods going down all at the same time. We had trouble getting them baited and back out to catch another. The fish were not big today and that didn’t matter one bit. 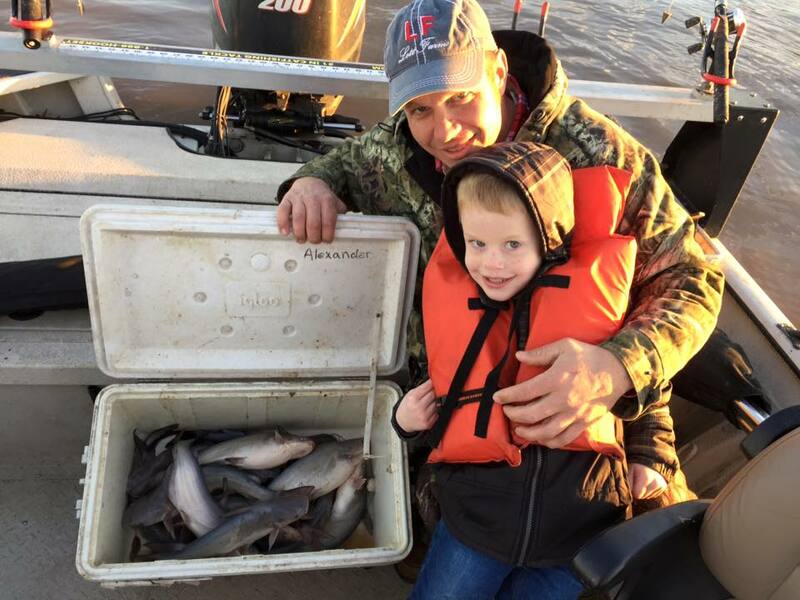 Just fun putting youngsters on fish making memories and planting the seed for a love of the outdoors. 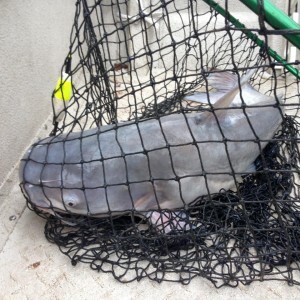 Today, we searched for big blue catfish at Oologah Lake today with Larry and Iris. 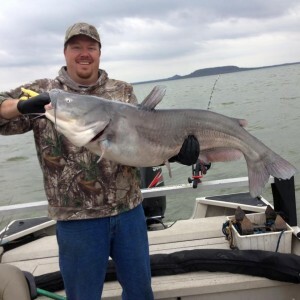 The big blues won today and we had to downsize our baits and catch some for the cooler. The bite was very light and they just never really turned into feeding mode today. We tried the flooded flats, shallow timber, deep timber, creeks channels, the river channel, and finally found a small group of feeding fish on a deep hump. The fish were really spread out in small groups all day in all water depths. Toughest day I’ve had blue catfishing in a really long time. As always, it was a great day on the water with friends/customers. 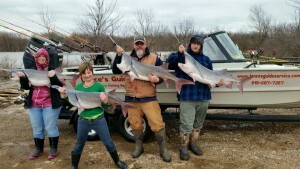 Today was the first spoonbill paddlefish Oologah Lake trip of the season (2015-2016) for Lance’s Guide Service. Great customer and friend, Paul, wanted to take his daughter Keely on a trip for her birthday. It was a cold windy day on Oologah Lake and we had a blast. 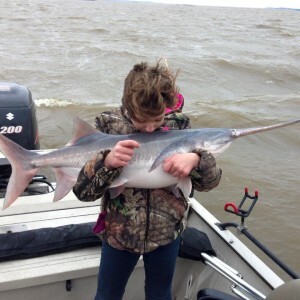 Here is Keely kissing her first spoonbill paddlefish!!! It’s always a pleasure to have this crew on the boat sharing memories. The lake is up over 5 feet, but the spoonbill paddlefish have moved into their typical wintering areas since we finally got some cooler weather. 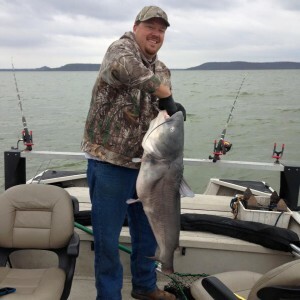 We did a teaching trip on how to catch blue catfish at Grand Lake in Oklahoma. We started the day out going over how to throw a cast net for shad and where to throw. Catching bait was easy, catching the bigger baits that stay on the hook was not so easy. We spent the majority or our time learning sonar and going over seasonal patterns. The fish were very scattered and not very active today. This has been a very unseasonably warm December and the fish have not migrated to wintering areas yet. We did spend a little time anchored up on a windblown cove catching a few active fish. This good eating size blue catfish took a bait that he couldn’t quite get fully into his mouth. Next, we spend some time using the MinnKota trolling motor dragging baits through suspended blue catfish. Well, it’s been a few weeks since I’ve been on the water and boy was it good to get back out there. Between hunting, Thanksgiving, and remodeling a bathroom it was time to get back on the water and see if the fish were back on a consistent pattern. 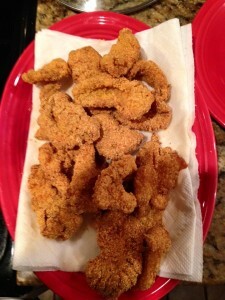 The crappie were slow…really slow this morning. 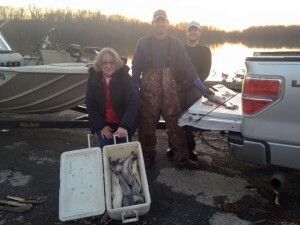 They decided to start releasing 15,000 out and shut the bite down, so we caught bait and started dragging deep water for blue catfish that were busting up bait balls. I started marking good shad in the river channel at the edge of a point. As I came up out of the river channel from 55ft of water to water in the 40ft range the bait was getting busted up with nice arches under and mixed in. We circled back and set up a controlled drift to drag baits with the MinnKota trolling motor. I started drifting at .7mph and we got a couple of taste testers, but they wouldn’t commit and take the bait. So, I lowered out speed to .5mph and that did the trick. The right long line rod slammed down and peeled drag making it very difficult for Brandon to get out of the rod holder. 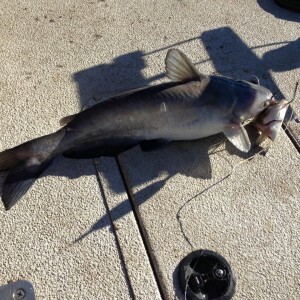 This blue had an attitude and did not want to get in the ProCat with us…but Brandon won the battle! 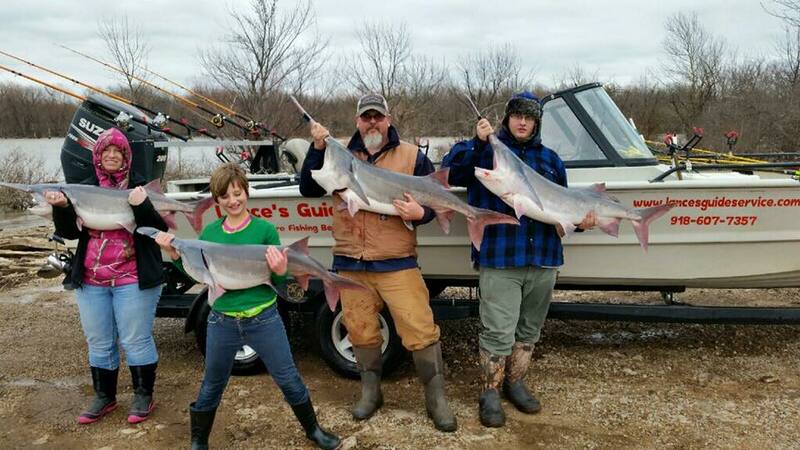 After a couple of fish on that drift, we decided to do some scouting and check on the spoonbill/paddlefish. The Oologah Lake spoonbill are all stacked up and ready in their usual locations this time of year. Next Sunday, we’ll get after them…but back to searching for other areas for blue catfish. 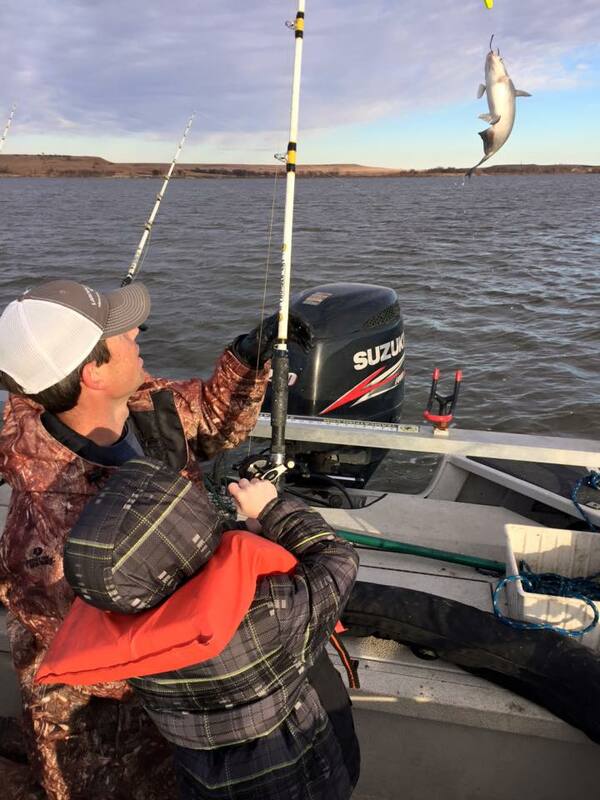 We decided to use the Humminbird side scan and locate fish in the long expanses of Oologah Lake’s shallow water since the south wind picked up and should be moving these fish into feeding areas…it did. We looked in really shallow water, but the the higher concentrations were using road beds and ditches to travel. We would set up just off of these areas after marking on side scan and cast towards the fish. FISH ON! We’d catch a handful in an area and then move on looking for another group. I’m sure we could have set there and waited for the next group to move through as blue catfish often do, but we really wanted to keep trying other areas that we hadn’t fished or at least not fished in some time. Oologah is a big lake with lots of structure and its a blast using the graph locating new areas or areas forgotten to find new groups of fish. Brandon said he cleaned 17 nice eating sized blues and we released all the fish over 10 pounds to continue making baby blues so we have plenty to catch for years to come.